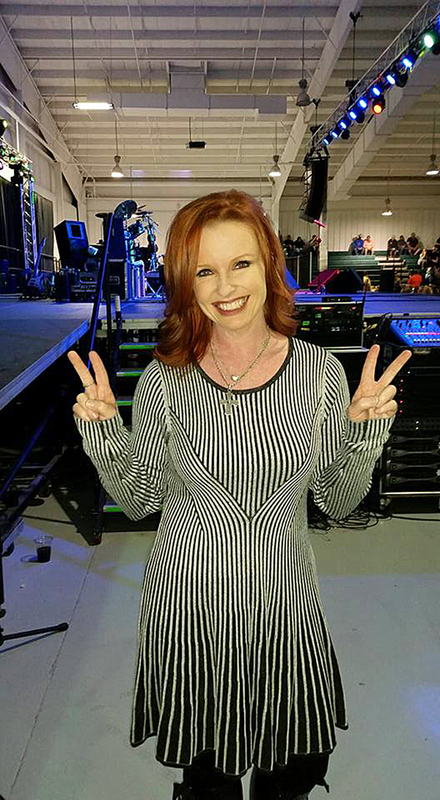 Susan Rose, taping a music video. 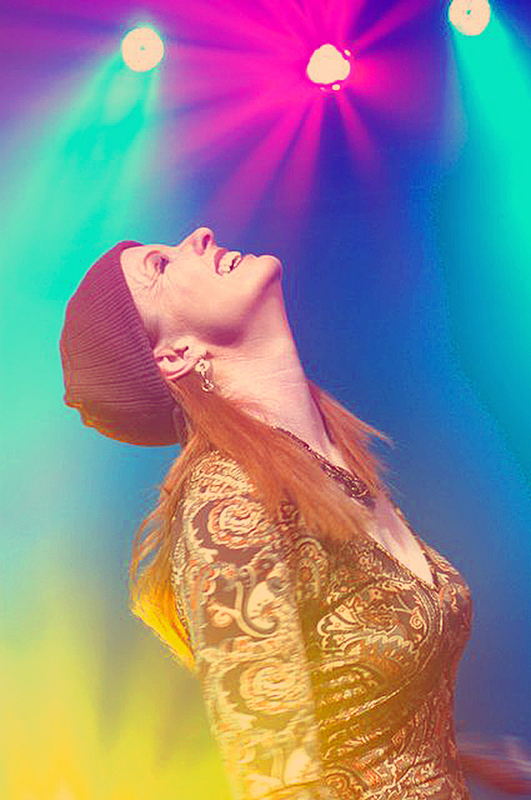 Lighting designer, lighting director, programmer and singer — Susan Rose is a multi-hyphenate, and damn proud of it. Having started out as a country singer at a young age, Rose went to school to learn more about audio recording to aid her singing career. She took a turn into lighting and never looked back. 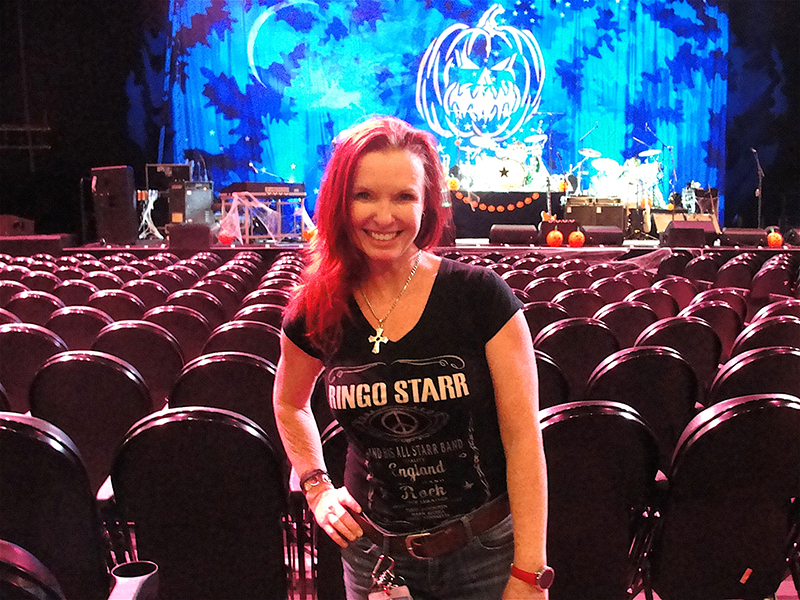 She’s been the lighting director for Ringo Starr for the past 16 years in support of Jeff Ravitz’s lighting design; she’s the second longest employee on the tour. She’s known as Squintress, the Red Tornado, and Miss Adventure; once you meet her, you’ll never forget her. She has quite the social media presence and documents her jaunts around the globe when on tour as she finds beer and wings in all her ports of call. PLSN had a chance to catch up with Rose in between tour stops this summer. PLSN: How did you get into the industry? Susan Rose: I started out wanting to be a country singer. Along the way, I went to Full Sail, not because I wanted to do technical stuff, but because I wanted to learn — honestly enough — how audio worked. I already had my own recording studio; I wanted to learn how it worked and be able to talk with engineers. Afterwards, I got an internship at Disney World in Orlando as a tech during the day, and then at night, I was doing my singing. In ‘94, I moved to Nashville, because, to be a country star, that’s where you go. That’s also where my lighting career was born. I got a job at Opryland as a spotlight operator, and the group Alabama were there that summer. Mike Swinford, who to this day is my mentor, was their LD. The theater had just bought a Wholehog console; the original Wholehog I. I was fascinated with it. I was 24, Mike saw this spark in me and started showing me things on the console. Every afternoon and between shows, I’m out there and he’s showing me something different. I was figuring out how this all worked. I’ve always been very technically-minded, which I got from my Dad, who was in the Army. I’ve got a creative side and a very technical side of my brain. I would stay up programming; it just made sense to me. When Alabama’s run was over, nobody at the theater knew how to run the console. I told them I thought I could, and they asked if I would program for some of the shows. I had no clue that this would be the start of my career. The concert series was now different artists, every few days. I set the console up for the artists that had LD’s — because no one knew how to run it back then — and for the artists that didn’t have LD’s, I ran the lights. In the meantime, a lot of nightclubs around town were catching wind that I programmed lights. I went to do this drag show in downtown Nashville, which had High End’s LCD controllers, which I had never touched before in my life, and they had HES Emulators. But I figured it out and was enjoying doing the programming and lights. Then another mentor and ally came along, who took me seriously — Jed Downing. We became good friends, and he told me that I was really good at this and had I ever thought about doing lighting. I’m like, ‘Oh no, I’m a singer. This is just fun.’ Jed went on to mention that Louise Mandrell was looking for an LD, and he set up me with an interview with her management. I’ve always been honest; I’ve never claimed to do something I can’t. I walked in and said, ‘Well, Jed recommended me, but I’m going to be honest — I just do lighting at Opryland; I’ve never done any of this before. I’m loving doing it, but I don’t have any experience. I’m a singer.’ They were willing to give it a try. I jumped from being a board op/programmer to an LD on tour, like, overnight. How did you take to touring? When I started touring with Louise, I was so eager to learn. We didn’t carry anything, so I had no other choice but to improvise every day and learn what the console was at the venues. I found myself drawing my own plot. It just clicked. All the sudden, I had this lighting plot and I was really, really enjoying it and getting creative. When I left the tour, I slipped back into music for a little while, but there was still always a spark in me with lighting. I worked as a singer with Lee Greenwood at his theater in Pigeon Forge, TN for two years until I got a job as a lighting tech for Disney Cruises. I went to Italy to program the nightclubs for the Disney Magic. After that project, I settled in Orlando and got a job with Cirque Du Soleil as they were building La Nouba at Disney. I was working there when I got a call from Louise Mandrell’s people asking me to come back and do some shows with them. Louise pulled me into her dressing room one day and asked me if I would be interested in coming back to work with her at her theater in Pigeon Forge. I had just moved to Orlando and was hesitant. I thought about it and I decided that I would come back for a year to Pigeon Forge. It’s now 19 years later and I’m still here! I spent until 2005, at Louise’s theater as her lighting designer, lighting director, heck, I even fixed all the lights myself! I learned a lot working with her. You also taught other people the Wholehog console. With the Wholehog being such a popular console, lighting companies around the world asked me to teach Wholehog classes. That’s when I wrote the Hog Quick Reference guide. I thought there’s got to be an easier way to explain to people how to run this console, and I sat down and wrote the guide just how I would tell somebody how to do it. Before I knew it, the quick reference guide had circulated around the world, translated into multiple languages. High End Systems and Flying Pig Systems added it on their websites. I thought, ‘Oh my god this is crazy!’ Still today, people tell me today that they’ve used it in their college classes. All this time, I had been developing a name for myself; not even trying, it just happened. How did you come to be the lighting director for Ringo Starr? 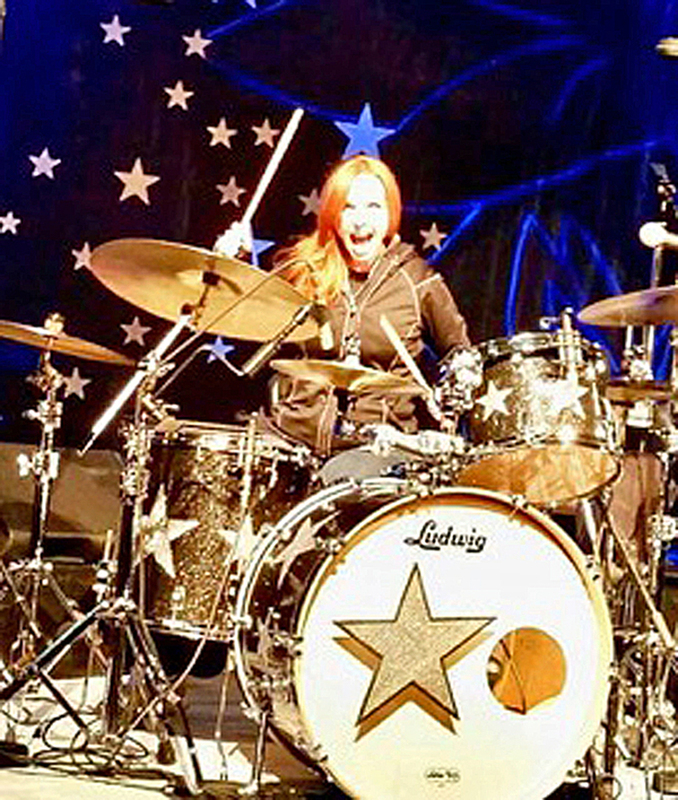 My name got brought up and thrown into the pot to consider in 2003 as a lighting director for Ringo Starr. I was told that they had heard that I was a great programmer and great to work with. I got a call from Morpheus saying they needed a programmer and was I interested. I thought that it sounded like fun; it really hadn’t dawned on me what I was getting to do. I talked it over with Louise, who was very supportive; that I should go do it. I learned so much on that tour, because this was the first time that I had ever toured with a full lighting package. I had to improvise with the lighting; deal with venues where we couldn’t get all our gear in. I loved it! When I got back, my freelance career just started taking off. I was just programming all the time, by word of mouth. Louise chose to close the theater in 2005, so I had a lot of decisions to make in 2006. It was scary; I could just as easily stay at the theater with the new owner; or go to Dollywood because I had been designing for Dollywood as well and other theaters around here. I decided that I was going to give this freelance career a chance; one chance. I’ll tell you, going freelance was the best decision I ever made in my life, because my life completely changed. My freelance career just took off, and not only am I programming for other LDs, now I’m actually designing shows. I’m designing shows for different theaters, Dollywood, and doing design and programming for cruise ships. In the meantime, Ringo went back out, and I’ve been called back ever since. I’m going into my 16th year with him now. It’s been an amazing journey with him. When he wasn’t touring, I went out with Hank Williams Jr. when he was co-headlining with Lynyrd Skynyrd. I toured with John Berry, a country artist. I learned so much on these tours, including the grandMA console. A pretty successful career you never intended to have. Right. 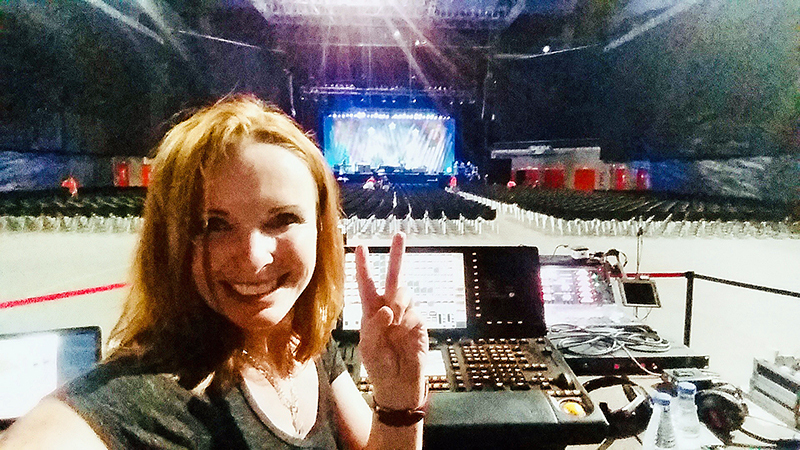 If you had ever asked me 20 years ago if this was going to be my career I’d be like, “No!’ But, I’m so blessed because I’ve had two amazing careers that I love, and my music career led me to my lighting career. Lighting is my career, because now I can just do music for the passion of it. I’m 40 years old, I’m not fooling myself. But I can do it for the passion now, and truly do it from my heart. I got to do all the things I dreamed of doing. I still perform; every time I do lighting, I’m still performing. Making people see the music. It really hit me one day when I was at the Ryman Auditorium working on a show. I’ve always dreamed of performing at the Grand Ole Opry. There I was doing a show’s lighting and I thought, ‘Susan you are performing at the Opry right now!’ If I had my life to do all over again, I would not change a thing. This is the path that I was meant to take. To this day, I still absolutely love it. I’m just so thankful that people have believed in me enough to give me a chance, to teach me, to hire me, and to encourage me; that’s how I ended up where I’m at now. What advice would you give to someone just starting out in this industry? Never quit learning; never, ever quit learning. It’s not just given to you, you’ve got to have that initiative to do it. Nobody made me learn how to program a new console; I did it because it interested me. If you are in a lighting shop or you are working somewhere and there is a console sitting there, don’t be afraid to ask ‘Hey, can I go play on this for a while?’ It’s so important to keep learning. To this day, I still learn. And never turn down an opportunity to do the thing that maybe you didn’t think you’d want to do. Some people say, ‘I’m going to be an audio engineer.’ Okay, that’s great, but if you have an opportunity to do lighting, or do carpentry, or do props, you might end up liking them. Look what happened to me. I went to school for audio and I’m a lighting designer now. You know, you never know where your path is going to take you. 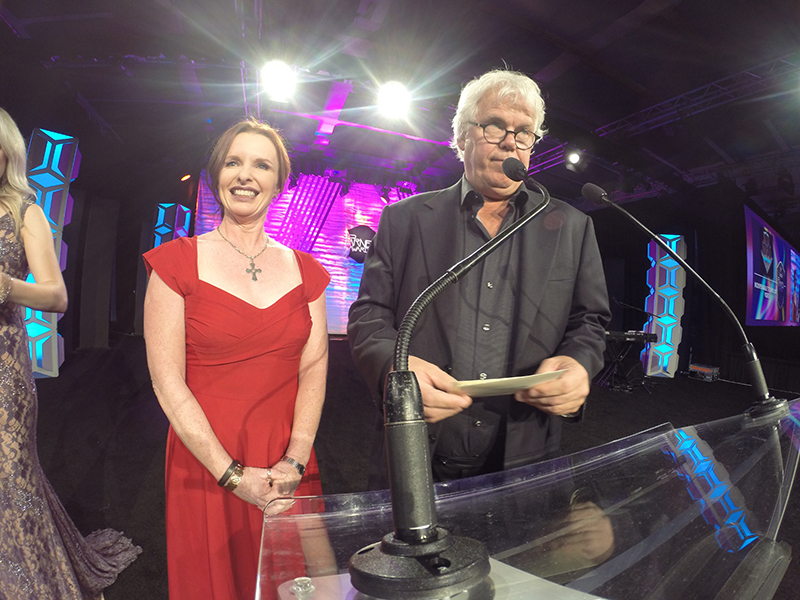 Susan Rose and Danny O’Bryen presenting an award at the 2018 Parnelli Awards.